I just want everyone inside and outside of Corporate America to know how happy I am about this. CNN dumps Eliot Spitzer from its lineup. Ever since Spitzer's involvement as a client in a high-priced prostitution ring (2008) and CNN's subsequent hiring of him, I stopped watching CNN. What were they thinking? Applause to the folks at CNN for finally getting their act together. Now I can continue to watch one of my favorites -- Anderson Cooper -- without guilt. There's my two cents for the week! What's yours? 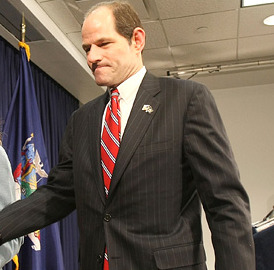 Photo credit: New York Times, "Spitzer Is Linked to Prostitution Ring."